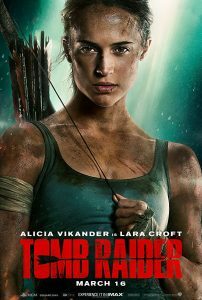 Tomb Raider (2018) – A Most Enjoyable Video Game Adaptation! Lara Croft is the fiercely independent daughter of an eccentric adventurer who vanished years earlier. Hoping to solve the mystery of her father’s disappearance, Croft embarks on a perilous journey to his last-known destination — a fabled tomb on a mythical island that might be somewhere off the coast of Japan. The stakes couldn’t be higher as Lara must rely on her sharp mind, blind faith and stubborn spirit to venture into the unknown. KIDS FIRST! Film Critic Arjun N. comments, “…one of the more enjoyable video game adaptations. The acting and the direction provide the same sense of adventure and excitement as the video game. This is sure to be a must-see watch for fans of Lara Croft or anything adventure related.” Morgan B. adds, “Mysteries, stupendous graphics, a terrific story and action all make this one awesome film! I love the original Lara Croft: Tomb Raider (2001) and Tomb Raider has just topped it. The ending had me breathless.” See their full reviews below. Tomb Raider is one of the more enjoyable video game adaptations. The acting and the direction provide the same sense of adventure and excitement as the video game. This is sure to be a must-see watch for fans of Lara Croft or anything adventure related. The story follows Lara Croft (Alicia Vikander), an intelligent yet reckless thrill-seeker, who embarks on an adventure unlike any other, when she finds evidence of her father’s disappearance. Seeking to solve the mystery of Richard Croft (Dominic West), Lara enlists the help of Lu Ren (Daniel Wu), a ship captain. However, their adventure lands up in the worst when their ship crashes to Yamatai. 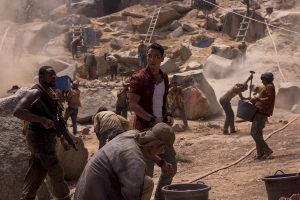 Lara soon finds herself in the hands of Matthias Vogel (Walton Goggins), a rival archeologist who will do anything to unlock the tomb within Yamatai. Realizing the tomb will unleash global genocide, Lara must find a way to stop Vogel while discovering secrets about her father. A licia Vikander, as Lara Croft, is my favorite character and splendidly presents the character of Lara Croft and her struggle/rise to become the well-known “Tomb Raider.” Her acerbic wit and vulnerability add a relatable extension to the character. Dominic West, as Richard Croft, excellently delivers his love for Lara and adventure. His mystery adds to plot, which leaves you wanting to know more about it at every turn. Daniel Wu, as Lu Ren, is a capable and funny companion to Lara and he shows a caring need to help the poor. Walton Goggins, as Matthias Vogel, portrays a threatening, yet over the top performance as the main villain, and it works for the most part. His involvement in the Croft conspiracy is interesting as well. Roar Uthaug incredibly directs the movie with a knowledge of the video games, resulting in a brisk pace from one scene to the next. My favorite scene is when Lara has to find a way out of a plane which is slowly falling off of a river bank. It is extremely intense and it reminded of me of fun, innovative levels from the Uncharted and Tomb Raider games. My problem with the movie is, despite a superb first half, the second half falls from an overreliance on CGI and over-the-top scenarios, often leading to unintentional comedy. It feels jarring when compared to such a first half. The message of the movie is to always be hopeful, as this allows Lara to keep fighting, even in the toughest of times. I give this film 4 out of 5 stars and recommend it for ages 10 to 18 because of its intense action. The movie releases in theaters on March 16, 2018 so check it out. Mysteries, stupendous graphics, a terrific story and action all make this one awesome film! I love the original Lara Croft: Tomb Raider (2001) and Tomb Raider has just topped it. The ending had me breathless. The astonishing graphics are craz y. The ancient tomb is amazing. Everything looks so realistic and very magical. I would love to travel through it and see the wonders inside. Another scene that has a lot of fantastic graphics is the one where Lara Croft and her new companion are caught in a humongous storm. The water looks stormy and crystal clear and I loved this scene because I felt cold and scared while watching it. Lara Croft (Alicia Vikander) is the kind of girl that you don’t want to mess with. After all, she raids tombs and runs after villains, and these happen to be her best qualities. Also she has a kindhearted, lovable side that wants her father back desperately after his mysterious disappearance seven years ago. She shows both sides of her personality and makes sure that she isn’t too nice or too mean. Lara Croft is also a good role model for girls who want to stand up for themselves and people who want to learn self-defense. These are the reasons why she is my favorite character. Yes, she knows how to shoot a bow and arrow. Watching all of the various fighting styles and action scenes Alicia Vikander is able to pull off is entertaining. My favorite scene is when Lara Croft and Mathias Vogel (Walton Goggins) are trying to escape the tomb and the tomb collapses. I also loved the fact that Lara shows a bit of both sides in this scene because she fighting and also knows that a dreadful fate awaits her father. The story line is easy to follow and a bit cliché, but worth watching due to the scenery and of course the treasure hunt. The treasure and the underground cave are amazing discoveries. Watch your step because each step is a risk. After all, you might right set off a booby trap or two. The end leads you to believe that there will be more Lara Croft stories in the future. Tomb Raider has a few messag es. They include: standing up for yourself when you’re in danger, helping others when they are in need, being yourself and not being afraid to do the impossible. Another message is the value of a good education which helps Lara solve puzzles throughout the tomb. I give this film5 out 5 stars and recommend it for ages 13 to 18. Tomb Raider does have a lot of violence and intense action which is bit too much for younger kids. Tomb Raider comes out in theaters on March 16, 2018 so be sure to check it out. Photo credit: © 2017 Warner Bros. Entertainment Inc. and Metro-Goldwyn-Mayer Pictures Inc.
Posted in Feature Film Reviews | Comments Off on Tomb Raider (2018) – A Most Enjoyable Video Game Adaptation! M eg Murry and her little brother, Charles Wallace, have been without their scientist father, Mr. Murry, for five years, ever since he discovered a new planet and used the concept known as a tesseract to travel there. Joined by Meg’s classmate Calvin O’Keefe and guided by the three mysterious astral travelers known as Mrs. Whatsit, Mrs. Who and Mrs. Which, the children brave a dangerous journey to a planet that possesses all of the evil in the universe. KIDS FIRST! 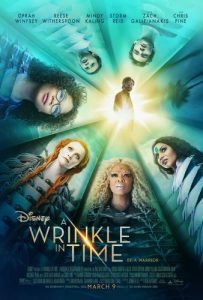 Film Critic Arjun N. comments, “A Wrinkle in Time is an enjoyable, yet somewhat flawed interpretation of the classic novel of the same name. The direction and special effects provide a world unlike any other. This is sure to be a watch for sci-fi fans.” Ryan R., adds, “I liked, but did not love this latest Disney film and here’s why…It is visually stunning, but unfortunately falls short in the storytelling.” See their full reviews below. A Wrinkle in Time is an enjoyable, yet somewhat flawed interpretation of the classic novel of the same name. The direction and special effects provide a world unlike any other. This is sure to be a watch for sci-fi fans. The story follows Meg Murry (Storm Reid), a genial teen who is the daughter of famed scientist Alex Murry (Chris Pine). After her father disappears, she goes through a period of insecurity and despair. Four years later, a group of primordial celestial beings – Mrs. Which (Oprah Winfrey), Mrs. Whatsit (Reese Witherspoon) and Mrs. Who (Mindy Kaling) visit Earth to help Meg find her father. Meg’s brother Charles Wallace (Deric McCabe) and friend Calvin (Levi Miller) also join the quest to find Alex. However, Meg is also brought in to help fight the “It”, an entity of darkness that threatens to destroy people’s happiness. Storm Reid, as Meg, excellently presents her inner struggle to be happy and accept herself and this adds a unique element to the story. As the movie progresses, she slowly rises beyond her doubts to become better. 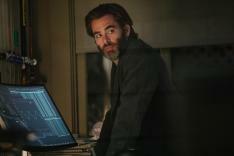 Chris Pine, as Alex, delivers an ardent love for science in his character and, while much of his character is witnessed before he disappears, the rest of his scenes add a performance filled with remorse. Deric McCabe, as Charles Wallace, is my favorite character due to his charismatic performance – full of comic relief. Levi Miller, as Calvin, encompasses a respectful companion who seems to be rather enamored by Meg. Oprah Winfrey, as Mrs. Which, is a wise mentor for Meg who guides her throughout her journey. Reese Witherspoon, as Mrs. Whatsit, is the least wise of the three celestial beings, but she provides a kind companion. Mindy Kaling, as Mrs. Who, represents an encyclopedia of character teeming with knowledge. Ava DuVernay incredibly directs the movie, as you feel as if you are a part of the world through her use of word building to convey a story. My favorite scene is the resolution to the main conflict, as it feels like an appropriate conclusion. My problem with the movie is that is unevenly paced, with the first half of the movie following generic clichés, despite a great first 10 minutes. But the movie gets running as soon as the second half begins, going into uncharted territory unlike any other movie. I also feel that the scenes for Alex a nd some other plot points are limited, resulting in a few disjointed, convoluted narrative at times and that could throw off some audience members. The message of the movie is about believing in yourself and accepting who you are. I give this film 3.5 out of 5 stars and recommend it for ages 6 to 18. The movie releases in theaters on March 9, 2018, so check it out. I liked, but did not love this latest Disney film and here’s why. 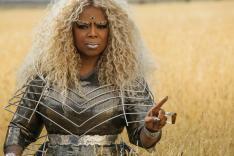 This film is an adaptation of the book, “A Wrinkle in Time” written by Madeleine L’Engle. 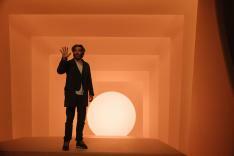 It is visually stunning, but unfortunately falls short in the storytelling. The protagonists are Meg Murry (Storm Reid) and her little brother Charles Wallace (Deric McCabe). Their scientist father, Mr. Murry has been missing for four years. Meg has had a rough time at school ever since her father’s disappearance. Her younger brother, Charles Wallace introduces Meg to three mysterious astral travelers. Meg is very skeptical of them at first, until she and Charles Wallace are informed by them that their father is not dead, but was taken by a dark force. Meg, Charles Wallace and her classmate Calvin (Levi Miller) go on an adventure with the three astral travelers, called the Misses. 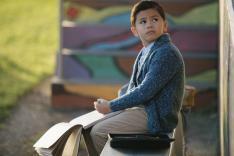 Will Meg and Charles Wallace find their dad? Well you must see the movie to find out the answer. I like the visuals, the cast and the message of this film. The visuals are very stunning. The scene where Mrs. Whatsit (Reese Witherspoon) becomes a leaf and gives the kids a ride looks very spectacular. It almost looks like this could be possible in real life. I also like the transitions of the worlds changing as a result of the characters’ actions. The visual effects bring this world to life. Another thing I like is the cast. Oprah’s, Reese Witherspoon’s and Mindy Kaling’s performances as the Misses are exceptional. They show different personalities which make them unique. Mrs. Whatsit is more negative, unlike Mrs. Who (Mindy Kaling), who is wise and uses quotes from famous people to relay her m essages. Mrs. Whatsit is more direct and rude, unlike Mrs. Which (Oprah Winfrey) who guides Meg when she is scared or unsure. Lastly, the messages in this movie are very important. They are about embracing your uniqueness, recognizing the importance of love and being brave enough to discover your inner warrior. One thing I do not like is the pace. In the first act, the pace is slow and that is fine, since it builds up the exposition. However, the final act of the movie feels very rushed and is unsatisfying. I feel the script has some holes in it which made me feel like the movie is missing some important details. This is why I did not really love the film. Even though this film is not “Pixar great” it still is a good movie to watch with your family. I give it 3 out of 5 stars and recommend it to kids ages 7 to 15. Adults might like it as well. I recommend this to people who have read the book or like book adaptations and fantasy movies. A Wrinkle In Time comes out March 9, 2018 in theaters nationwide. 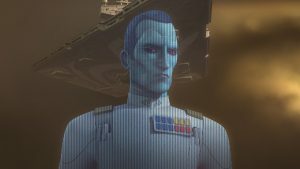 Star Wars Rebels: Series Finale – Bringing Families Together. 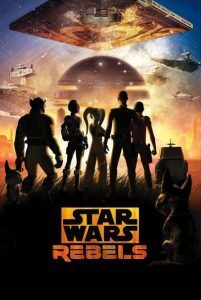 Prepa re yourself for the epic series finale of Star Wars Rebels! It all starts Monday, March 5th on Disney XD. The Ghost crew joins the growing Rebel Alliance, struggling to unite against the Galactic Empire. 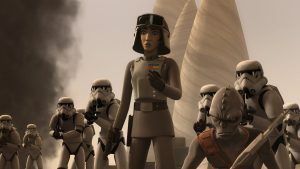 However, when a new Imperial threat arises on Lothal, Ezra leads the crew back to his home world to defeat the oppressive forces of the Empire, under the command of the cunning Grand Admiral Thrawn. Old friends are reunited and new allegiances are forged as the series builds to its epic conclusion. KIDS FIRST! 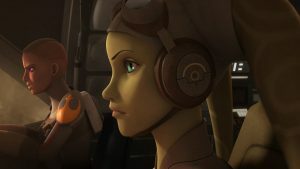 Film Critic Calista B. comments, “Even though I am not a fan of Star Wars Rebels, this finale is very well put together and has a very satisfying ending.” See her full review below. Even though I am not a fan of Star Wars Rebels, this finale is very well put together and has a very satisfying ending. These final episodes tell the ending of the fight to free the planet Lothal from the rule of The Empire. It’s the final fight between The Empire and The Rebels, being led by Ezra Bridger. I do have to make a disclaimer for anyone interested in this show. This is a continuity heavy, episodic show. I went into this show with barely any information and I was mostly lost. I would definitely recommend watching the whole series or else you’ll probably be as lost as me. I plan to watch the series now, after watching the final episodes. H owever, even though I went in blind, there is one thing I really loved at this premiere. That is the love of Star Wars the audience radiated. There are cosplayers, people with lightsabers, little kids dressed as x-wing fighters and more. It was so cool to see all these people gathering together for one common interest. The actors also shared that same enjoyment of this show as the audience did, the love for the Star Wars franchise was palpable in the theater. It was nice to see this passion basically emanate from everyone! 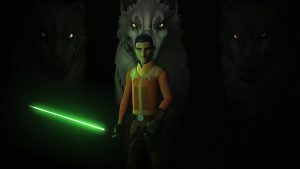 The director, Dave Filoni’s message about selflessness and how the force is being one with all cosmic energy, how the dark-side is a drive to power not love, also resonated in these episodes and is very well delivered. The best thing about Star Wars is that it brings families together. So many fans say they watch Star Wars Rebel as a family. The episodes are also really good. While I didn’t feel the same connection as most of the audience, I can appreciate things like the action. I love the action scenes in these episodes. They are very well animated, they felt very fast and exciting and are very entertaining. I also think the characters are really cool, especially Sebene and Hera. Of course, you got to love these large and in-charge female characters! The animation is kind of the only thing that isn’t top notch. Don’t get me wrong, it isn’t bad, but it isn’t perfect. I enjoy it somewhat, as I like the artistic style, but it feels somewhat fake and plastic-like. Oddly enough, the Stormtroopers look weirdly realistic. My only real complaint is that the show doesn’t feel any different than other Star Wars stories. While this does take place in between Episode III and Episode IV, I don’t feel like it is that different than the other stories. Star Wars is simple, yeah, but there is room to expand. I give this show 4 out of 5 stars and recommend to ages 8 to 18. The final episodes come out on March 5. Posted in TV | Comments Off on Star Wars Rebels: Series Finale – Bringing Families Together.